What makes us SIMPLY stand out from the rest? Simply Roofline Ltd are now firmly established throughout East Anglia as the leading specialists in the supply/installation of Pvcu fascias, soffits, cladding and guttering products, bulk purchased cost effectively from the leading extrusion manufacturer passing on massive savings directly to our customers. From humble beginnings back in 2006, Simply Roofline Ltd filled a void in the replacement roof line marketplace, which was then and still is today, over run by double glazing companies, some jack of all trades, with very little or limited knowledge and experience of replacement roof line practices. We are registered installers of Freefoam Plastic Building Products, specialising specifically in Pvcu roof line and cladding replacement, fitting the same product day in day out, has been advantageous in us setting the highest professional installation standards, well beyond most of our competitors. 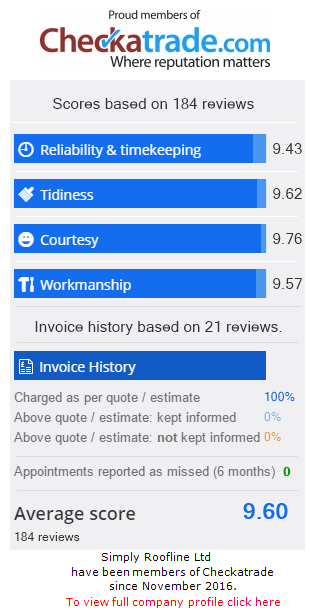 As a friendly and still to this day a family run business, our honest, courteous, no nonsense approach instilling traditional old fashioned customer service values, sadly lacking so often in today’s home improvement industry, really does ensure dealing with Simply Roofline Ltd is a most enjoyable, straight forward and stress free consumer experience. Our vast specialised knowledge and expertise in replacement roof line projects coupled with the benefit of lowest product cost resulting from our preferential bulk purchasing facilities with the manufacturer ensures that dealing with ourselves does represent the consumers best buy in the area. Not only does the guarantee’s given by Freefoam and ourselves make the product outstanding but some of the unique features which make us the market leaders in our field. These features include hidden ventilation, this allows roof joists to breathe to prevent any dampness which can lead to rot in the future. We always fit a bird comb and sometimes even insect mesh to prevent any unwanted guests in your attic. A new roof line system is worthless without these, but many of our competitors do not fit these as standard. Expert installation includes carefully removing any old materials to make sure there are no problems later. To protect the structure of your home, we replace rotten rafter feet and rotten felt up to the first batten. We only use our own dedicated roof line fitting teams who meticulously improve your home to the highest professional installation standards and that’s simply a promise. We supply / install high quality A rated pvcu windows doors and conservatories. As a home improvement company we also fit external GRP door canopies and carports please call us now to arrange your free no obligation quotation.